May Yu River (Myanmar) - Smoke billowed from at least three burning villages in the remote section of Rakhine state where Myanmar's military is carrying out sweeps for militants, an AFP reporter saw Wednesday. The violence, which erupted six days ago after Rohingya militants staged surprise raids on police posts, has shown little sign of abating, leaving at least 110 confirmed dead and sending thousands fleeing. The displaced include ethnic Rakhine Buddhists and the persecuted Rohingya Muslim minority, thousands of whom have massed at the "zero line" border with Bangladesh which they are barred from crossing. The bodies of two Rohingya women and two children washed up on Bangladeshi soil on Wednesday, an official there told AFP, as villagers took to rickety boats or tried to swim across a frontier river. On Wednesday villagers in Rakhine continued to flee their homes. A Rohingya villager near the town of Maungdaw, speaking on condition of anonymity, said residents fled his hamlet as security forces approached and torched their homes. "Villagers are running away... where do we have to live now?" he told AFP by telephone. It was not immediately possible to verify his account but Rohingya who have made it into Bangladesh have brought similar testimony with them. 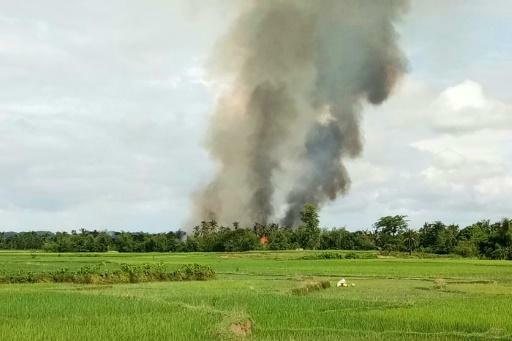 Large fires were visible early Wednesday from the May Yu river that cuts through the area worst hit by unrest, according to an AFP reporter travelling by boat on a Myanmar government-led trip to Maungdaw. Outlying villages have witnessed some of the worst violence, raising fears security operations are shielded from scrutiny by the danger and inaccessibility of the area. Rohingya villagers are stuck between police and troops hunting down the insurgents and militants offering sporadic resistance. But testimony gathered by AFP from the displaced reaching Bangladesh suggests some Rohinyga men are heeding a call-to-arms by the militants and are staying behind to fight in their villages. The Arakan Rohingya Solidarity Army claims its men launched Friday's surprise attacks on police posts, killing 11 state officials, with knives, homemade explosives and a few guns. After years in which the Rohingya largely avoided violence, the group last October carried out deadly attacks on police posts. That prompted a months-long security crackdown by Myanmar's army which left scores dead and forced 87,000 people to flee to Bangladesh. The UN believes that military crackdown may have amounted to ethnic cleansing of the Rohingya -- allegations denied by the army. On Sunday Pope Francis led mounting international calls for the protection of "our Rohingya brothers". The UN has also urged Myanmar to protect civilians during its operations and called on Bangladesh to allow the displaced into their territory -- something Dhaka is loath to do given it already hosts 400,000 displaced Rohingya. A Myanmar government official on Tuesday said security forces would use "maximum restraint" in coming days but insisted on the country's right to defend itself from "terrorists". Myanmar's Rohingya are the world's largest stateless minority and endure severe restrictions on their movements.